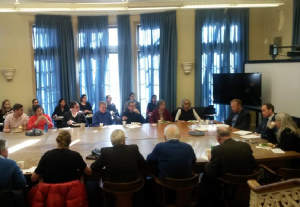 On November 29, 2017, the Asper Centre Constitutional Roundtable hosted Alistair Price, Associate Professor in Law, University of Cape Town. Price’s presentation was titled “The Relationship between Constitutional and Tort Damages for State Failures to Protect in Canada, England, and South Africa.” Richard Stacey, Assistant Professor, University of Toronto Faculty of Law was the discussant. What is the appropriate legal approach to damages caused by public officials failing to meet their state-mandated positive duties? Public law compensation often grants little or no monetary remedy for damages when it is available at all. Tort is a more viable legal recourse for adequate monetary remedy. However, the standard for tort liability vis-à-vis public officials differs in Canada, England, and South Africa. Each has adapted a unique approach in adopting tort law to the context of public wrongs. On the conservative pole of the spectrum, English law has preserved the traditional torts approach. There is no positive legal obligation in tort required of public officials beyond that which is also ascribed to a private citizen. As defendants in tort, English law applies the same standard to public officials and private citizens. South Africa is positioned at the opposing pole of this spectrum. Public officials are obliged to adequately perform their public duties. They are liable for damages flowing from omission or negligent performance of their ascribed positive responsibilities. Public officials are distinct from private citizens, held to a higher standard. Canada has taken a middle approach. Price argues that this evades the excesses of the South African approach and the deficiencies of the English approach. In South Africa, the basic relational structure of tort liability has been altered in adapting the legal system to address public wrongs. In England, this relational structure is persevered but the legal system fails to recognize that public officials occupy a status of categorical superiority relative to private citizens by virtue of their position. Applying the traditional private law approach of basic equality between the parties fails to recognize the judicial inequality that exists between the parties in the context of public damages. In Canada, failure to perform positive public duties is actionable in tort law, but the basic relational structure still exists. The public official’s duty must have been a duty to this plaintiff at the material time. This often manifests in the context of policing. The Jane Doe v Metropolitan Toronto (Municipality) Commissioners of Police case is one such instance. In commenting on Price’s paper and presentation, Richard Stacey offered a different perspective, one more favourable to the South African approach. Whereas Price finds laudable moderation in the Canadian approach, Stacey adopts a more categorical perspective wherein Canada is straddling the distinct paradigms embodied by England and South Africa. Canada is in a state of transition, moving toward the South African approach. Stacey likened the current Canadian position to the geocentric model before the paradigm shift to a heliocentric model. Anomalies amass. Sub-theories grow in number to keep the theoretical framework coherent until the threshold is met and a paradigm shift occurs. The paradigm shift is from merely applying traditional tort principles to adopting public law solutions for damages caused by public officials failing to fulfill their positive duties. The dissent and majority judgements in the Paradis Honey Ltd v Canada (Minister of Agriculture and Afri-Foods case represent the debate between these approaches within the context of Canadian law. What accounts for these differences? Price posits that the constitutional culture of each country plays a role. The constitutional culture in South Africa is deliberately transformative. The constitution is perceived as an instrument for social change. Damages from public negligence is just one more domain to which it is applied. By contrast, English constitutional culture is more conservative in bent. Canadian constitutional culture contains elements of both, each contributing to the fertile soil of our living tree. How a disbalance will affect its continued development remains to be seen. This entry was posted in Commentary and tagged Comparative Constitutional Law, Constitutional Forum, Constitutional Roundatable. Bookmark the permalink.